How did आप guys feel about the new Information about Ichigo in chapter 514 in the manga? The whole thing about Ichigo being a Quincy too at first kinda made me mad. I was like what in the world is Kubo Tite doing? Ichigo was already a Shinigami, Vizard, and had Fullbring (which I hated द्वारा the way). A now a Quincy. Then I thought about it and can see where that makes sense. It explains why Ichigo's father left the soul society, Shinigami and Quincy don't get along and a romance between them wouldn't be stand for. Also when Ichigo's mother died. Her reaction when Ichigo ran towards Grand Fisher's lure seems to fit as if she could see the Hollow. Thinking about that, Masaki being a Quincy makes sense to me. Feels kind of familiar. Aizen कहा he'd controlled all of Ichigo's actions for an awful long time, and I thought that was B.S. And now we're made to believe that someone else has had his invisible hands in Ichigo's life, albeit in a less invasive way. But you're right, they're basically making Ichigo into a Swiss Army Knife, a person with every capability who somehow manages to pull them all off better than the people who have been wielding them all of their lives. As for your thoughts about why it makes sense, I'd say this creates just as many plot holes as it closes. I'm sure they'll go through the long and expansive explanation of what happened with Isshin, why his mother was killed द्वारा a Hollow when she had these powers, and why Soul Society decided to let the whole thing slide, though I sincerely doubt Kubo will answer all of those सवालों fully (he hasn't exactly done a great job so far). What it will almost certainly be left unexplained is why Ichigo never manifested anything with Ishida and why in the world no one told him about this beforehand (let's face it, he's seen and heard far worse). Perhaps Kubo's going somewhere really special with this, but I get the feeling he's only creating और needless complication. Yeah, I was just trying to rationalize it somehow. I still don't like it. well i was like"whoa!!!! Wait what?!" so if masaki isnt human and its a quincy than ichigo isnt human at all?! So than why cant yuzu see ghosts? I thought it was because she was half human and half shinigami. But quincy are like human. This new info is too much to take in! For me to. I was like that what the hell is going on here ? I agree Kubo should had just left Ichigo being a Vizard/Fullbringer I mean it does make sense but it's kinda ridiculous I hate when they make the main character one of those that have every power from every type of creature. 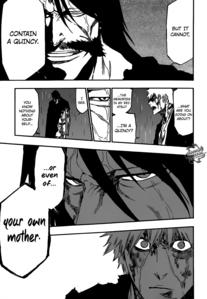 And correct me if I'm wrong but shouldn't have Ichigo's Fullbring have returned to him since he killed Ginjo. I though that when Fullbringers died any effect that their powers had on people (like Tsukishima's) was reversed, and wasn't what Ginjo did of stealing Ichigo's fullbring and transferring it a power of his?